His Holiness Dalai Lama performed the groundbreaking blessing for the construction of ‘Library and Learning Centre’ on July 29 at Thiksey. The Library and Learning Centre is initiated by Nawang Chamba Stanzin, Thiksay Khenpo Rinpoche. The Library worth rs 4 crore project and the learning centre with classrooms and hostel facilities is expected to be completed in 2 years. The aim of the learning centre is to promote and develop secular ethics by creating a platform to learn and analyse on different subjects by people of different faiths and will offer a meditation course. Also, an initiative to launch a book on secular ethic sin the school curriculum will be carried out. Appreciating the infrastructural development and changes, His Holiness said, “Change is a natural phenomenon and the materialistic development will definitely take place with time. But with this we need to think about the inner development. With highly sophisticated machineries, technology and infrastructure how developed the countries will be there is always a room for inner peace and happiness among the people”. His Holiness said that with development people are getting addicted to alcohol, drugs and other substance and many are committing suicide. With this there is an immense need to understand Buddhism for inner peace and happiness. “We should strive to make everyone happy rather being selfish. The real happiness lies in making others happy. And in all religion, compassion, love and respect to others is always preached and we should practice it in our daily life”, His Holiness added. His Holiness stressed on the learning centre to preach secular ethics by opening it up for the people of different faiths to understand and analyze the teachings for further implication in life. And also ask to be compassionate and kind for inner peace and happiness. Dorjay Motup, CEC expressed gratitude to His Holiness for visiting Ladakh and blessing the people every year. 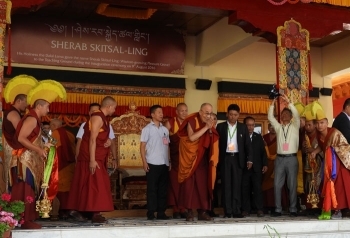 He said that the communal harmony and peace in the region is maintained because of His Holiness blessing and teaching. He further expressed gratitude to Thiksey Khanpo Rinpoche for the library and learning centre initiative which will prove beneficial for the young generation specially to learn and study many things. He also extended all support from the Hill council to complete the project. Talking about the conference on ‘Indian Himalayan Buddhist Communities: Cultural Preservation and Identity–Challenges & Way Forward in 21st Century’ held in Gurgaon, Thupstan Chhewang, MP informed that a resolution was passed to develop all the monasteries into a learning centre as practiced earlier. He said that in this growing and developing world there is a need to learn, understand and analyse all religion. Talking about the challenges of less interest among the people of the region in reading and writing, he further said that such learning and library will encourage many youths to gain the interest and will also open up the horizon to explore more books and gain knowledge. Ladakh being a strategically important region he stressed on the importance of living in harmony and unity. Chering Dorjay MLC said that the benefit from the library and learning centre should be taken not only by the monks but by the common lay man. He further added that until and unless people make use of the library in their daily life, the purpose of establishing library and learning centre won’t be fulfilled. Nawang Chamba Stanzin, Thiksay Khenpo Rinpoche , Ven.Shedup Chamba, President, Ladakh Gonpa Association and Tsewang Thinles, President, LBA also spoke on the occasion. Later, His Holiness Dalai Lama presided to the luncheon programme organized by LAHDC, Leh at Sindhu Ghat, Shey.